Alternative Treatments for Children Exhibiting Violent Behavior | OFF KLTR! 1. If I were a parent with a child exhibiting violent behavior, I would definitely start with homeopathy. I would read the book Rage Free Kids. 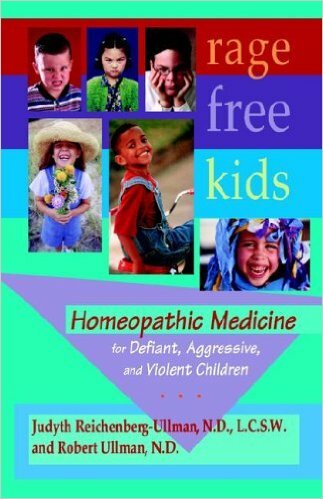 After reading Rage Free Kids, I would find a homeopath. You can find recommendations for homeopaths in the Boston area on my Practitioners Page. 2. In conjunction with the homeopathy, I would start working with healer extraordinaire Joy delGuidice (who practices energy kinesiology among many other healing modalities). I know that the child is exhibiting the violent behavior, but as I always say, the child is a mirror for the mom and if the mom can clear her old stuff – her parent’s old stuff – her grandparent’s old stuff, that clearing will most likely have a tremendous healing effect on the child exhibiting violent behavior. Families are systems…moms’ and kids’ energies are so interconnected…and Joy can treat the family unit. The healing will be much, much faster than trying to resolve the problem only through the child. 3. Naturopathy (or naturopathic medicine). Naturopaths focus a lot on nutrition. They suggest vitamins and supplements and sometimes even homeopathic remedies. Unfortunately, because naturopathic medicine isn’t covered by insurance in Massachusetts, there don’t appear to be many naturopaths in the area. In fact, they all seem to move to the more progressive west coast where insurance covers naturopaths! But NH seems to be getting on the naturopathic train, so you might also consider checking NH. You can search here for a naturopath. I also got a very strong recommendation from one of my own practitioners for Dr. Hubbich, a very alternative MD in Watertown. Like naturopaths, Dr. Hubbich seems to focus a lot on diet, as well as herbs and homeopathy and a wide array of alternative treatments.